With some of the best international cuisine, a thriving contemporary art scene and a waterfront parkway that rivals anything in the city, we admit we’re really feeling Queens these days. So much so, in fact, that even the diehard Manhattanites and Brooklynites among us are flirting with the idea of turning our fling into something more serious. The best part? 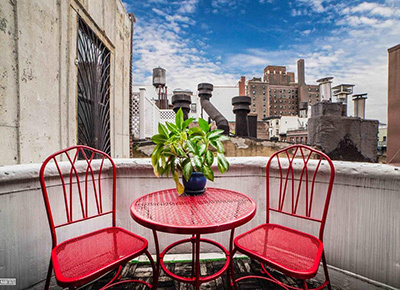 It’s still possible to find rentals in this bustling borough that don’t make us queasy. According to the StreetEasy Rent Index, the median rents in Manhattan and Brooklyn are $3,183 and $2,562, respectively, so we set out to see what we could get in that price range (and a few above that) in Queens. Spoiler: We were very, very impressed. The 940-square-foot private outdoor space and three spacious closets at this penthouse apartment are impressive, but it’s the bustling Rego Park neighborhood—with its abundance of parks, shops, restaurants and nightlife—that’ll make you want to sign that lease. Imagine a life where out-of-town friends and relatives could stay with you without taking over your living room couch and/or floor. That could be your reality with this three-bedroom Ridgewood apartment. Plus, it’s walking distance to the M and L, so you and your guests can still easily hit all of your favorite Manhattan and Brooklyn haunts. When we think of studio living, we conjure up images of cramped windowless walkups with the proverbial shower in the kitchen. Which is why this ultra-modern Rego Park studio—with its floor-to-ceiling windows, spacious living room and fully equipped gourmet kitchen—is kind of blowing our mind. Trust us, you won’t miss living in Manhattan when you have panoramic views of it from nearly every room of your luxury high-rise. Our favorite part of this 1,200-square-foot tenth-floor unit is the open-concept kitchen, which is perfect for hosting large gatherings. Attention, pet owners: This sprawling corner unit in a prewar building is pet-friendly and a short walk from the waterfront Astoria Park, which has plenty of off-leash areas. Also, with all the closet space and built-in storage, you won’t have to worry about your new shoes becoming chew toys. We would be perfectly happy signing the lease on this place without even stepping foot inside, because we’d spend all of our time enjoying the massive outdoor living space anyway. Just picture all the intimate backyard dinner parties you could host and all the morning yoga you could practice on the grass. Live like you’re on a permanent vacation at this new development, which consists of three skyline-defining glass towers. The resort-style amenities include a media room, valet parking, a private park, an indoor lap pool and a rooftop pool. Plus, the sunny west-facing unit features floor-to-ceiling windows, oak flooring and an in-unit washer/dryer. Consider this your suburban starter home. You can enjoy the serenity of living on a tree-lined street in a quaint residential neighborhood without forgoing the convenience of having everything you need at your doorstep. In fact, to enjoy said conveniences (gym, salon, media room, catering kitchen, game room and children’s playroom), you don’t even need to leave the building. This restored Hunters Point luxury unit is ideal for anyone who works from home (the loft is currently configured has a one-bedroom plus a home office). Answer emails from the furnished rooftop, take a dip in the pool during your lunch break and if you need to attend a meeting in the city, you’re a five-minute walk from the Queensboro Plaza Station. Live like an actual queen in Queens. Sure, it’s not exactly the most affordable, but when you consider all the fine details of this historic home—or convince a few besties to move in with you—it actually seems like a bargain. The regal home features a classic colonial staircase, stained-glass windows throughout, a manicured courtyard and seven spacious bedrooms, including a basement guest quarters with its own sauna and whirlpool bath.